Two of our directors, Alyson Marlow and Lee Peck, have worked as journalists in the motoring press giving Lee Peck Media a unique insight into gaining clients outstanding and innovative editorial coverage. Alyson, who for many years was the navigator in a privateer rally team, was a motoring editor of some note and as a broadcast journalist Lee delivered new car road tests on both radio and TV. Over the years the agency as worked with a number of motor groups and manufacturers. Brands include BMW, Ford, Honda, KIA, Land Rover Jaguar, Mazda Mercedes, Peugeot, Rolls Royce Motor Company and Volvo. Typically our work has spanned media relations, event management, dealership launches and corporate social responsibility. 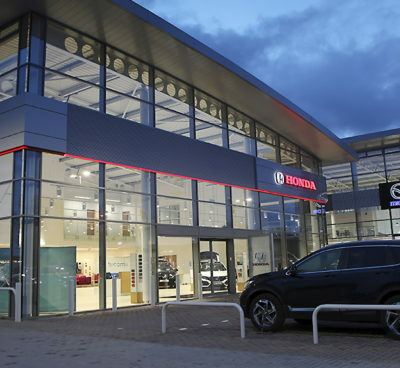 Lee Peck Media is delighted to act for Hendy Group, one of the UK’s largest dealership networks. Based in Hampshire, Hendy is a £1bn turnover company with 2,000 employees and operations from Exeter to Eastbourne. Lee Peck Media generates constant coverage for Hendy in both consumer and trade channels ensuring this dynamic organisation leads from the front. The agency delivered the media relations for Hendy’s acquisition of Westover Group gaining outstanding coverage across a range of platforms, on and off line including negotiating front page leads in important regional newspaper titles. Delivering innovative media opportunities is our trademark. A UK first, we brokered the deal which saw an electric car taking a starring role in a pantomime at the country’s fourth largest theatre. We also organised KIA product placement on BBC television, which attracted the attention of KIA at board level.